... and the Halloween costumes are officially chosen. Despite the fact that I started asking them in September, we are now up against the wire because of course I waited to be *sure* of what they wanted to be and then couldn't find what they were looking for. So last night we talked about it again and came to the final decisions. Bearhug wants to be a sword-wielding wizard (he initially wanted to be a witch, until we informed him that witches are girls, and boy "witches" are wizards). He really liked the swords and pitchforks when we went to the Halloween store last Saturday, so that's where the sword part comes in. We made him choose one or the other, lol. He wasn't really interested in any of our suggestions that might be more suited to carrying a sword, but that's ok :). Cuddlebug wants to be a bunny at all costs. So since we couldn't find a bunny costume (that was reasonably priced anyway) and there's no time to sew one at this point, I asked him if he'd be ok if I made one out of sweats. He's cool with that. He actually wants to be a "glowing bunny" (as in radioactive??) and I have no idea how we're going to pull that off. He said something about silver so maybe I'll get some silver glitter to put on his costume. Little Bitty couldn't care less about Halloween. He loves Thomas though so I'm pretty sure he'll be fine with wearing his brothers' Thomas outfit. I'm pretty sure he would NOT be interested in any costume that involved anything other than regular clothes at this point (the one I'm thinking of is made from a sweatsuit) so we'll stick with that. I hope it's not too big for him. Guess I should check that. The alternative would be a farmer or Mario or Bob the Builder, we have some overalls that would fit him and I could do any of those from overalls. Assuming he would agree to wear overalls, which is questionable. So there you have it! There is a special-needs Halloween party going on this Saturday, and one at our church on Tuesday (which we will probably only go to the last part, they typically can't handle the overstimulation of being there the whole time). On Friday, we may try to do a small amount of trick-or-treating (maybe one street or part of one street, however much they are up for) and then do our usual, ice cream! 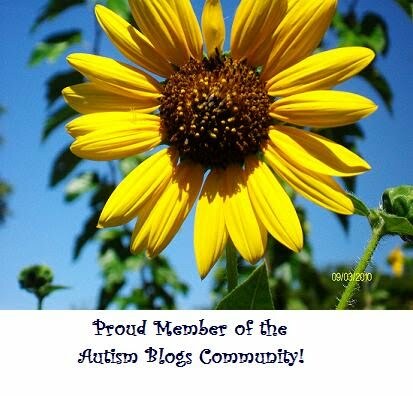 I am coming back to read and comment further, from what I read, we share similar experiences with our spectrum kiddos, I had no idea that it was ASD related though - good to know. My life seems so surreal and confusing and I feel like such a clutz of a mom until I hear other families with similar struggles. More later tater!